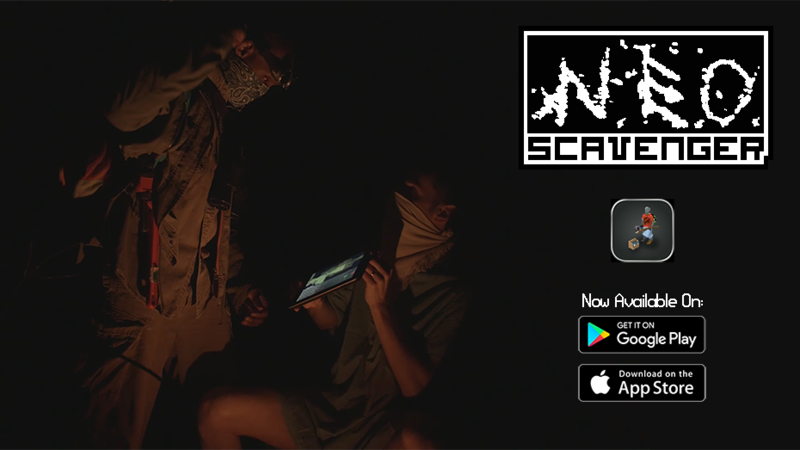 NEO Scavenger mobile trailer may be the trailer I’m most proud of producing [scripting and editing]. That said… most advice I’d offer from the project is terrible! Seriously, it’s awful. But it worked for us. So, hopefully you at least you find it funny? For added fun, think about what it would look like to cosplay for your own game’s trailer. Like I said, it’s probably a bad idea. Though it might be a useful practice If you’re showing your game at an actual trade show like PAX? Terrible advice number two: show… Wait, no. Here’s the thing: NEO Scavenger is… hard to make sense of at first glance. Heck! Even after a good number of glances, you might still be lost. The game really plays up that “tell, don’t show” angle, especially in combat where it’s mostly about what happens in your imagination (and not on screen). This was where we identified the perfect way to employ Dan’s half-naked cosplay: acting-out a scenario from the game! NEO Scavenger takes place in a “slightly” crappier version of our world. Plus it was winter when we started this. So a simple backyard in late Winter looks like it’s survived an apocalypse. Dan was close with a cinematography team, Digital Cyclops — who was amazing, by the way. And even more conveniently, Dalias Blake showed up. Dude’s a master of looking intimidating. But yeah, seriously. “Show, don’t tell” is the right way to go with a game trailer 99% of the time. Except for when your game is literally the opposite. We did the live acting thing because it was the best way to put unfamiliar audiences into the mindset of the game. So, this might be the worst advice yet. Never ask your players, “what should I say in the trailer?” You’re gonna get a whole lot of useless garbage that you’ll have to wade through. Glad we didn’t do that. Well, we sorta did. If you ask “What precise experience in this game captures this full emotion?” And you really curate the question? You might be able to focus people towards one sentence responses — you might get something usable. You might even find something perfect! Now we actually had players to ask. We had over a hundred responses. So, that’s a lot for me to pick from. But seriously, crowd-sourcing your script is usually such a bad idea. Now I’m gonna stop right here and show you the trailer. Then we’ll get to the last few pieces of terrible advice. Cool? Let’s check it out. Cool. Final pieces of bad advice? 4. Shove players’ words into onscreen actors’ mouths. Nobody likes it when you put words in their mouth, but we did it anyway. You couldn’t see our actor’s mouths because they were (like characters in the game) wearing rags that covered their mouths as rudimentary air filters. So,we made sure our actors acted like they were talking, with the plan of putting another actor’s voice on them. We did this, because it was important to me that the players of the game really gave voice to the experience. But because players aren’t typically voice actors, I went for the uber players: those who love the game, but also create their own content. I’m not 100% sure that the we did this perfectly. But I am sure that it was the right call. Because when you share player’s voices, you can actually capture their passion for the game. These guys, Nelson and Phil — they really really love NEO Scavenger. So I was like, “Yes! I’m-I’m going to use you guys because you really really get it!” Usually people can tell if somebody’s just hired help. But passion transcends. If you dare try this kind of approach? Go for it, but go for the passionate. This is the weirdest one: we took all these player testimonies, the half-naked cosplay, voice actors, and glimpses of gameplay, and we brought it all together — in a way that’s… clearly not for everybody. The best trailers are just one clear story. It starts, it ends. You feel like you’re along for the ride. This is a universal truth. You can keep that in your pocket. But we had like over a hundred stories. And we wanted to link it into a single one. That took first writing a modular script — designed with targeted emergence. This modular script had one goal: extract the stories, and assemble it into one single story. Like I said, you gotta be super specific to make any of this work. This was really just planning — that mostly worked because NEO Scavenger just kind of automatically naturally generates these kinds of stories, and because of the pre-existing audience. NEO Scavenger’s tone is so weird! Like normally? You want people to feel smart, powerful, capable of doing anything! And excited when they end the trailer. Maybe itching for a fight! Instead, we figured it was better to make people feel icky! You’re welcome to copy the idea if you think it might work for you. But because we wanted to hit the distinctives of the game, and what made it what it is, we ended on the creep-factor. If you’re looking for something actually usable here, I’d say that’s it: focus on your game’s distinct one-of-a-kind feeling. Also, it’s worth noting that we lightened-up the whole “bleak as hell” thing. At least a tiny bit. So yeah, this is all terrible advice because it’s really specific to NEO Scavenger. Consider your game deeply. How people play it, how they talk about it, what they dream about after playing it before bed time. Then craft your game’s trailer around these experiences. I’m M. Joshua. Find me at mjoshua.com. And feel free to subscribe, for the next time we look at some Game Trailer Takeaways.